Tomorrow, I’m going to announce that Faery Swap, my middle grade fantasy, is live in both ebook and print! (If you want the ebook now, CLICK HERE). Today, I’m going to talk a little about my decision to indie publish Faery Swap, and thoughts in general about publishing indie middle grade books. 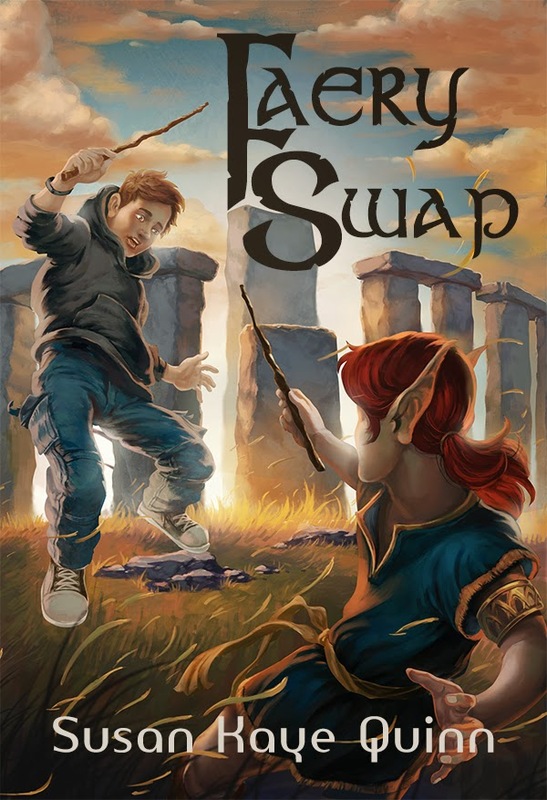 I actually wrote Faery Swap over two years ago… and it was my second middle grade story. The first, a wormhole-and-clone-filled space opera, was my first serious attempt at publication. (That my non-serious-attempt at romance got published first is an indication of how tough the middle grade publishing market is.) I put my books-for-kids on the backburner as my indie publishing career took off – because I knew reaching middle grade readers through indie publishing was tough. I absolutely loved Faery Swap, but it was still first draft and I found it hard to justify the time to revise it when all my indie works were calling to me. Still, I pined to have it in the hands of young readers someday. Middle Grade: Indie or Trad-Pub? Obviously, I chose to indie publish. For this book, it’s the right choice, even if only my kids and a few of their friends and teachers read it (of course, I hope for more than that, but I will be satisfied just to have the thing out in the world). But I also choose to indie publish my middle grade because the landscape of publishing middle grade is slowly changing in ways that help indie middle grade authors. Paper Distribution is the first obvious hurdle that middle grade indie books face. It’s very unlikely you will be on the bookshelves of the B&N, and that is where a lot of middle grade books are discovered. Plus, middle grade readers, even with the proliferation of cheaper-and-cheaper ereaders, still read paper books. A lot of paper books. Add in the price factor (Print On Demand books tend to be more expensive than trad-pub print runs), and it’s tough to get those paper books into kids hands. Why this is changing: More people are buying print books online (vs. browsing in the bookstore). For me, personally, this is the first Christmas I won’t be trekking to the bookstore to load up on books for gifts – I’m ordering them all online (in paper) instead. This is because the bookstore just doesn’t have half the books I want, and I end up ordering them online anyway. As bookshelf space continues to shrink, the bookshelf in the bookstore counts less and less as a discovery tool… even for children’s books. Reviews are always difficult to get, but reviews for middle grade books have been even more important, because major review channels like the School Library Journal, Publisher’s Weekly, Kirkus and Booklist serve as social-proof to parents, teachers, and librarians, that middle grade books are good to pass onto their children. These review channels are how these gatekeepers discover new books for kids, but they either exclude indie books (School Library Journal), are indie-unfriendly (Booklist wants paper books months in advance), or charge indie authors a hefty fee to be reviewed in a segregated section that librarians and teachers are much less likely to read (Publisher’s Weekly, Kirkus). Why this is changing: Goodreads and other online media are reaching these gatekeepers (parents, teachers, librarians), so while the kids themselves are not online, the gatekeepers are. Review services like NetGalley are now open to indie books, providing an end-run around the review channels. Having used NetGalley for about six months, with several friends’ middle grade books, I can attest to the fact that you can reach teachers and librarians that are otherwise inaccessible to indie authors. Having contact with the gatekeepers is, of course, just the first step. Then you have to convince them to give your middle grade indie book a try – and the bar will be higher for your middle grade book than the romance that you wrote! After all, this is a book they’re giving to their kid! They want to know that it’s quality. Having read your prior (adult) works can help – I’m personally hoping that readers who have enjoyed my other works will take a chance on my indie middle grade for their children and students. Discovery is the constant challenge for all authors everywhere. Adult and young adult authors have an advantage because their audience are actually perusing the online bestseller lists, subscribing to lists like Bookbub, and going on Goodreads to see what their friends are reading. For middle grade, once again, it’s the gatekeepers who are doing these activities, and usually not looking in those places for middle grade books. The kids themselves will scan the bookshelves at the bookstore (no indie books) and libraries (few indie books). So… the gatekeepers themselves are becoming more aware and more open to indie books. Because the “gatekeepers” in this case are adults who happen to be teachers and parents and librarians who have personal experience with adult indie books (or young adult indie). When they have a positive experience with indie books, they are more willing to take a chance on those with their students and children. Kids themselves are starting to use services like Goodreads in their schools, reviewing books and adding them to their TBR lists. They are slowly bypassing the gatekeepers to discover books on their own. I could have submitted Faery Swap to a dozen (or more) agents or a dozen (or more) children’s publishers who take direct submissions. Best case scenario would have Faery Swap published in a couple years, possibly reviewed by a big journal, and maybe on the book shelf for 3-6 months at a select number of B&Ns around the country. Two years was simply too long for me to wait for this book – I wanted to have Faery Swap in my children’s hands while they could still brag about it to their friends. But I’m also betting that over those two years, I can get Faery Swap into as many (if not more) children’s hands as I could waiting for that shot at a journal review or a spot on the shelf for a few kids to find it by accidentally browsing past it. Because waiting around to be discovered on a shelf is the 20th century method of book discovery, not the 21st – and I plan to use all of the 21st century ways I know to get Faery Swap out into the world. …a catalog for teachers and librarians (winter and spring). DOWNLOAD THE CATALOG and SIGN UP TO BE NOTIFIED when the next catalog comes out. Or you can join my mailing list to get the email when Faery Swap comes out tomorrow! Yep, the MG market is a challenging one to get into, especially if you don't have print copies available. I've published two stories, because they would not be ignored. It's way past time, I gave them the push they deserve. Wishing you success with Faery Swap. I'm excited to watch your middle-grade career bloom. Whatever you do, you seem to do well. I am glad you took on this challenge. Like all the challenges you and other indie authors have faced, time has proven your friend and people are beginning to get the message about all of you out there! Good luck. Can't wait to read it, right after Third Daughter! Awesome blog, Sue. Can't wait to read Faery Swap! This was both useful and heartening to read. I'm indie-publishing my own MG novel, The Flying Burgowski, via CreateSpace, and am hungry for advice on getting reviews and reaching gatekeepers. Thank you for being such a resource! Great post, Susan. It isn't easy getting attention for our MG/Tween books. Sharing experiences makes the job easier and more fun. I'm headed to NetGalley. Thank you. All the best with Faery Swap. I published my MG SF The Far Horizon about two years ago. The book has great reviews, but getting sales is hard. I can very much see that, Patty! I've got my marketing plan put together… we'll see how it goes. Like much of being indie, it's an experiment!